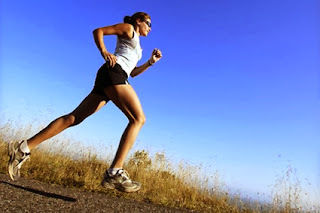 While looking for some tips about running, I found and article explaing some basic guides to running. Below are some items that I think are most important. What are the very first steps of becoming a runner? The first step, truly, is to start where you are, rather than from where you want to be. It's the No. 1 mistake, and I made it myself when I first started to run: It's a nice spring day; you're excited; you have your new outfit and shoes, so you try going as far as you can, as fast as you can. And when you finish, you're either crying or not feeling very good. It destroys the flow of the momentum. If you're coming off the couch, the best thing overweight folks can do is start a walking program. Develop a base of, say, four weeks of walking 30 to 45 minutes three times a week, and build on that. If you're not overweight, but you're getting off the couch, start with a run-walk program. Start with 30 minutes three times a week, every other day. What should we eat before and after runs—whether we're looking to lose weight or not? If you're running for 30 minutes, you don't really need to eat before. Just make sure you're eating regularly throughout the day. For post-workout, there's a short window of recovery. Within 30 minutes of finishing your run, have a snack that's high in carbohydrates and protein. Think: celery sticks and little bit of peanut butter, or maybe almonds and a piece of fruit. How do you know when you're ready to race? Give yourself at least two to three months. Once you can either continuously run or run-walk in those 30 minute intervals, you ought to sign on the dotted line for a 5K. What's the value of racing? It provides accountability to a goal, which is motivating. Plus, it's exciting. There's a big difference between exercising in general and training for something, because you know you've got to prepare for your D-Day, so it brings purpose to your workouts. And it also shows progress. In your first workout, you may have run a mile and a half in 30 minutes. And now you can do a 5K in 30 or 35 minutes. Any other general advice for new runners? Mix up your routine. It's a great motivator to run one day, and then try, say, a Zumba or cycling class. You feel good about coming back to that second run of the week because you're not doing the same darn thing every day. And truly listen to your body as you train. Some people do my Zero to Running program in 10 weeks, but it took me three months to do it when I first started. Listen to your body, and don't push through pain. Also, don't compare yourself to your neighbor, or your husband or wife who runs. Everyone is unique.